Wholesale set of six (6) of our New Thin Blue Line Silicone Ring Size 9. Bulk packaging on sets of 6 of our rings. Our high quality silicone rings are built for your active lifestyle. If you work hard and play hard this is the ring for you! 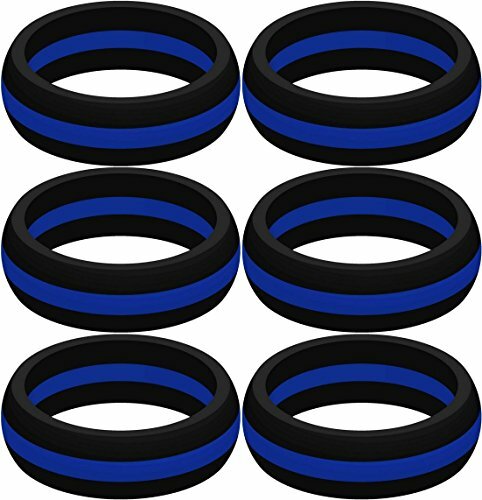 Set of six of Thin Blue Line ring - show support for Law Enforcement! WEAR WHERE YOU WORK. Silicone rings are a great fit for hard, demanding, or metal-free work environments. WEAR WHERE YOU PLAY. Go camping, climb a mountain, even go to the beach and never worry about taking off your ring. WEAR WHERE YOU WORKOUT. This ring will work as hard as you do in the weight room, exercise room, and anywhere else you can take it. WEAR EVERYWHERE. Show your commitment with this comfortable, flexible, hypoalergenic ring. It makes a perfect gift too! If you have any questions about this product by SayitBands, contact us by completing and submitting the form below. If you are looking for a specif part number, please include it with your message.